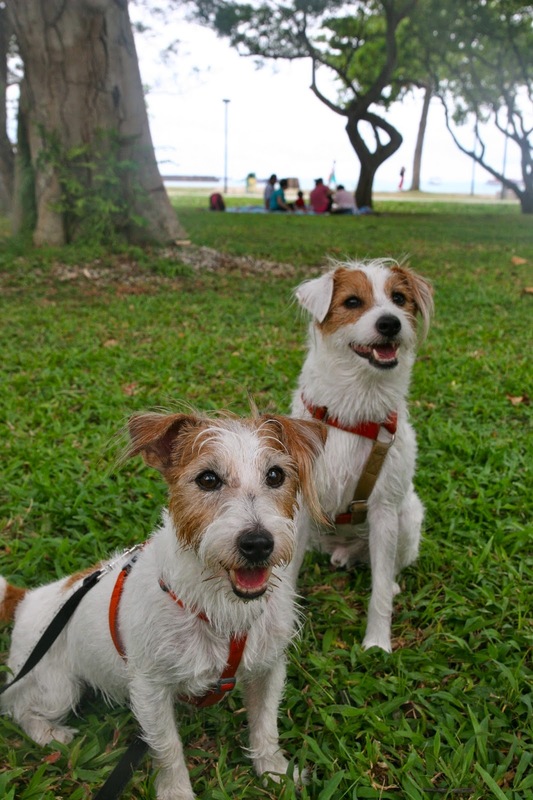 After seeing Pecan ah ma's success during our recent JRT hike, our parents decided to take yet another leap of faith. 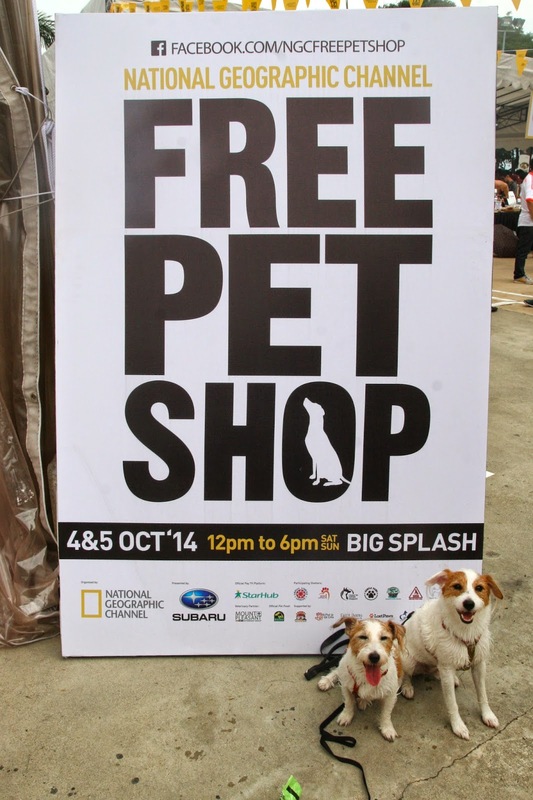 They... *drum rolls*...brought ah ma to her very first dog event - The National Geographic Channel Free Pet Shop - that took place over the weekend at Big Splash! And yap, ah ma did amazing once again! She did not snap at a single dog and even proceeded to greet many of them! 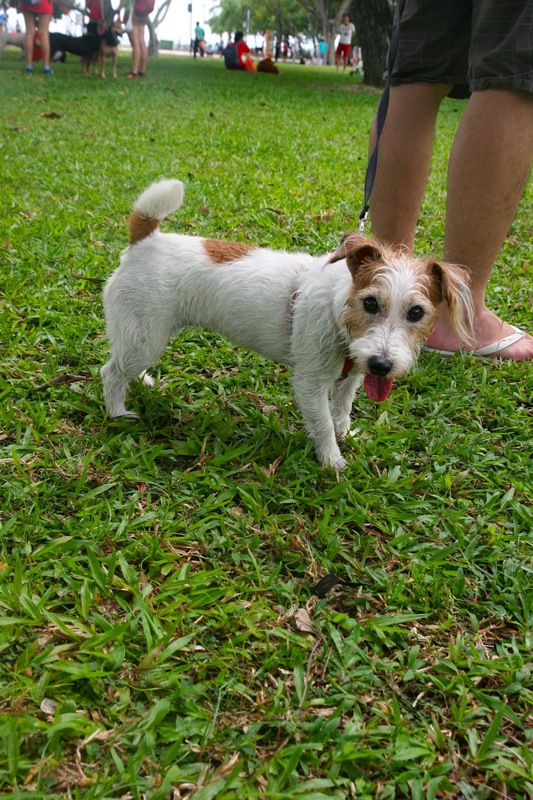 Of course, our parents were still on high alert and made an effort to distract her when her posture got too tense and her tail started wagging a tad bit hard. She responded every single time! Ah ma was in such high spirits that she couldn't stop grinning throughout the event. 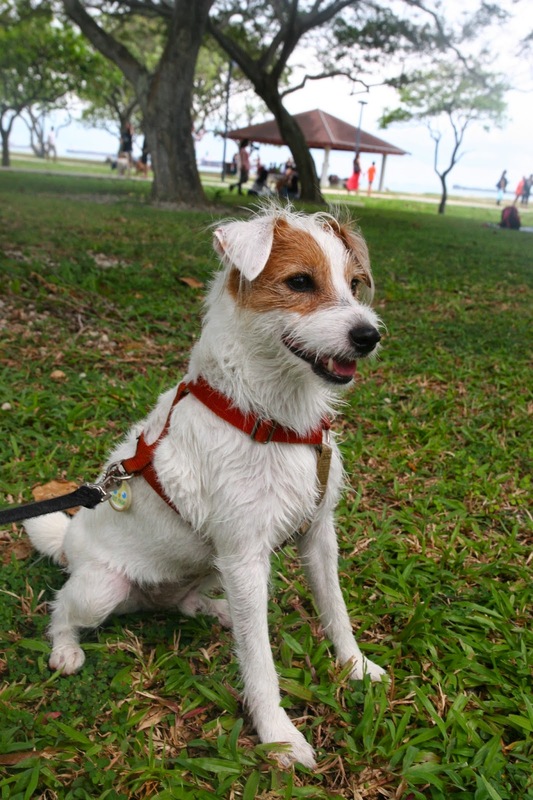 And I'm sure she was equally pleased to be enjoying a nice day out with many other canines! Since we weren't here to adopt yet another sibling (I swear Daddy will kill Mummy if she did that), we decided to keep ourselves busy with the agility course laid out. 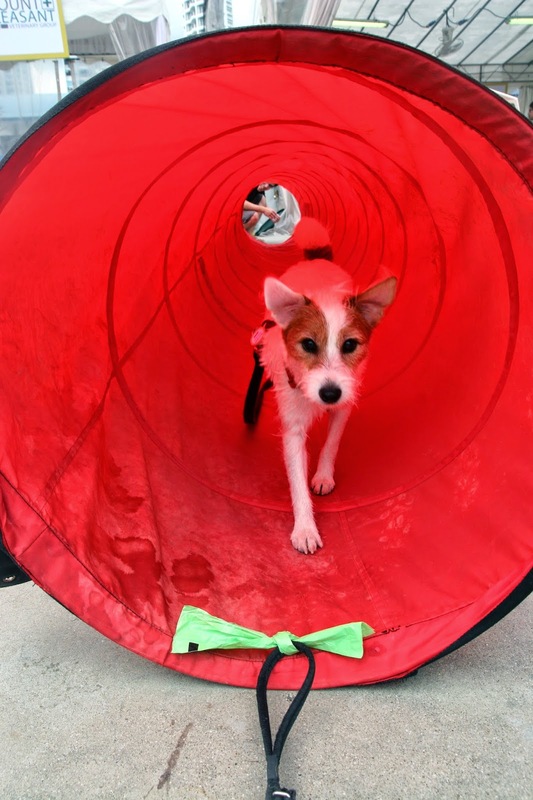 It was ah ma's first attempt on the tunnel and she was a little hesitant in the beginning. But when there are treats involved, Pecan would do anything. Like ANYTHING. And within seconds of Daddy tossing a large piece of treat inside the tunnel.... in she went, ate it..and out she came. I was excited cheering her on! Once ah ma was out, I had my turn! After we got bored of trying out the trial, we headed to the area of the adoption drive and something caught our eyes. YES... 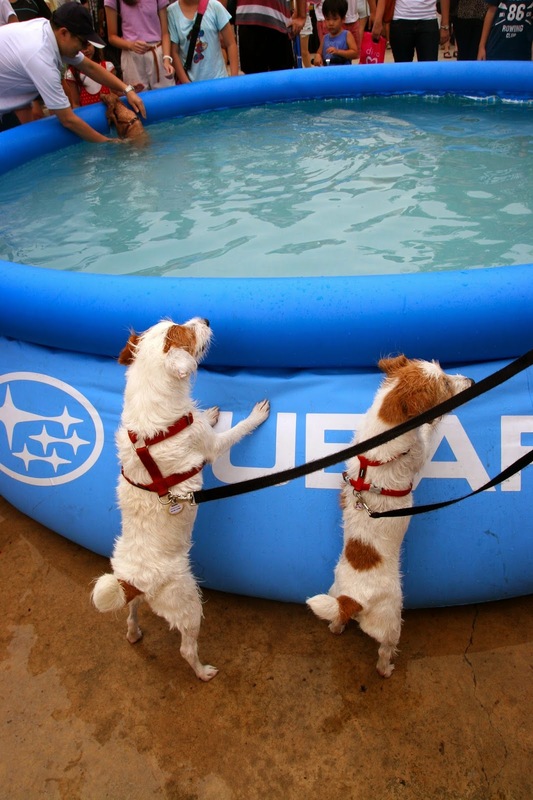 THERE WAS A DOGGIE POOL! We couldn't take our eyes of it. Even though we just got groomed the day before, our awesome Mummy couldn't care less and allowed us to do what we loved to do! 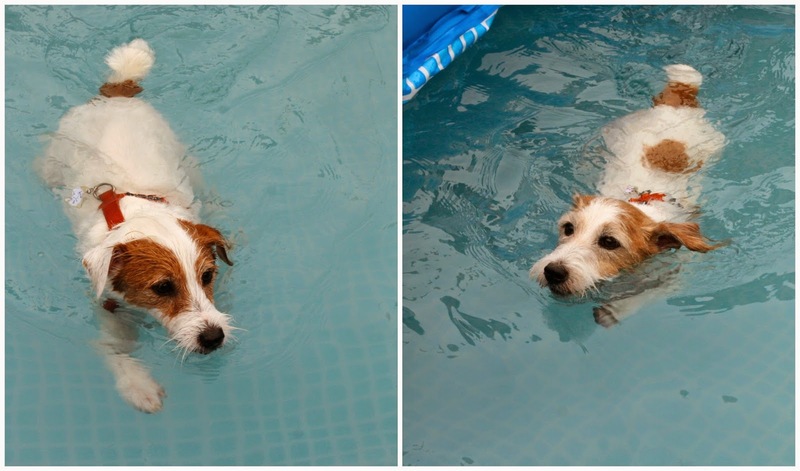 As Mummy wasn't expecting there to be a pool for dogs to take a dip and cool off, she certainly didn't come prepared. So, there was no monkey and no monster for us to rescue. We quickly got bored of the aimless paddle and wanted out after we cooled down. 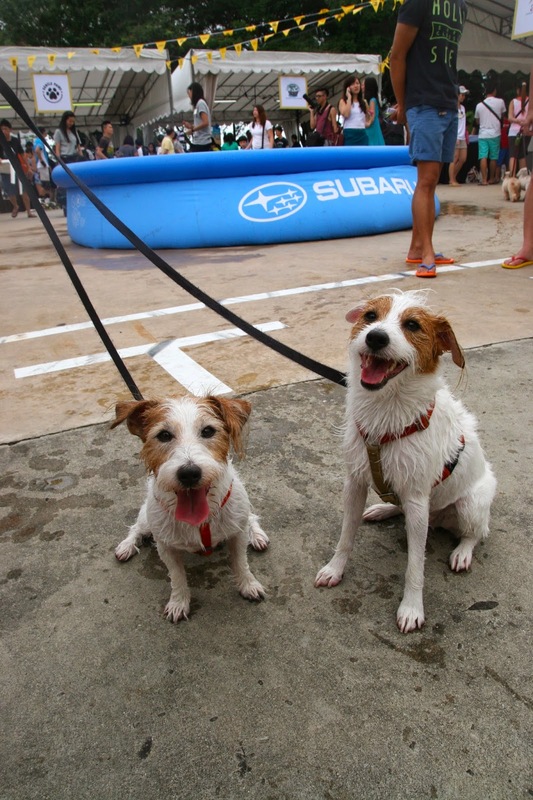 Nonetheless, we were happy to be able to dip our paws and get soaked in cool water. Since Mummy also didn't prepare towels, we decided to take a stroll along the beach to dry off. I sat around a bit and enjoyed the lovely sea breeze (and the BBQ aromas)! Oh oh... on a side note, when we got groomed the day before, Mummy had requested for Auntie Lulu to keep our ear hairs long. And when we got home, we suddenly realized that ah ma's ear hairs are of different lengths! We initially thought that Auntie Lulu had snipped one side off. But after careful observation (and comparison with old photos), we discovered that ah ma has been donning an asymmetrical bob all these while! How *cough* cool *cough* is that! Mummy was contemplating whether she should snip it off to make it even. But seeing how adorable Pecan looks now, she decided against it. Needless to say, ah ma's current nickname is "Asymmetrical Bob"! Anyway, it was a great day out! Not only was it haze-free, the weather was cool and comfortable! And although we didn't take much photos (cos Mummy was concentrating on ah ma), we had lotsa fun! 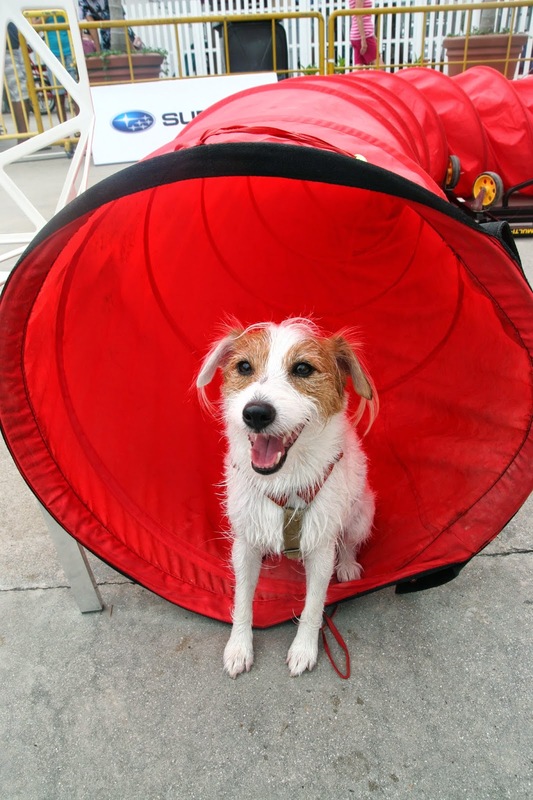 Now that Pecan is certified dog event-friendly, I can foresee more fun outings coming up soon! That is a lot of pictures already!! LOL... all very cute... wish Donna has the inclination to try out the swimming pool of tunnel... but her highness has some issues of her own. Haha! Awwww tunnel pictures are so cute and so proud of Pecan Ahma. smelly ahma looks so happy in the first photo!